Inspired by the character from the movie Monty Python And The Holy Grail, The Knights of Ni terrorize the local villages with their demands of ever incresingly large shruberies and threats of herring beatings. If you can't enjoy this one, I can no longer help you! Haha Epic! Ni, Ni, Ni! Thanks guys! I had a really bad day yesterday and needed some fun today, and this is what came of it. Glad it makes others smile too! I was always under the impression that all CCC entries should be in the MOC forum? If not, c'est la vie and sorry for posting in the wrong place m'lords! Oh yes! I've been waiting for someone to do this! Great work. Awesome! Beware the deadly herring! I've been waiting for someone to make this for quite awhile now, and it seems as though your just that person. Incredibly done! 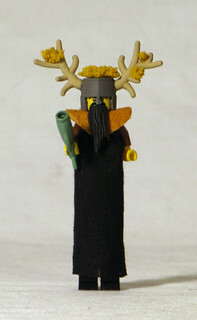 shmails wrote: I was always under the impression that all CCC entries should be in the MOC forum? If not, c'est la vie and sorry for posting in the wrong place m'lords! Not a big deal--we're here to fix it. I'm not sure how rigorously the distinction is policed, since the CCC is always a time when there is a flurry of activity on the forums, but in *principle* it has always been the case that Customs go in the Customs forum and Castle MOCs in the MOCs forum--contest or no context. 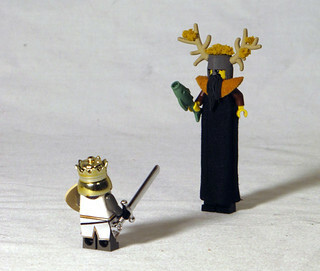 Of course, the line seems fuzzier when you get the Green Knight or Boses doing their thing, where they make a "custom" minifig using only purist parts--a terminological confusion stemming from the double-use of the word "custom." On the one hand it seems to mean non-standard creation (any MOC would qualify); on the other it is generally used of modified parts (which most typically come together in a Custom fig)--those belong here. Simply amazing! I'm surprised no one did this sooner. You really captured the character well.